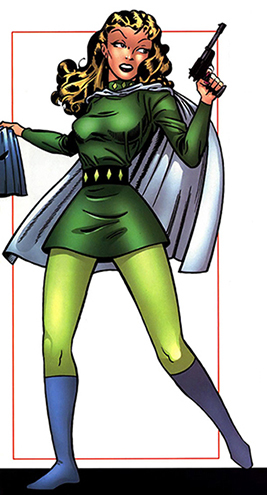 Powers/Abilities: The Asbestos Lady was a gifted scientist who turned to crime. She made a costume for herself from flame retardant asbestos that theoretically protected her from temperatures up to 1600 degrees Fahrenheit (the melting point of the material), though the costume would have required significant internal cooling. Murdock wielded a flame-thrower in combat and carried guns that fired asbestos-lined bullets. 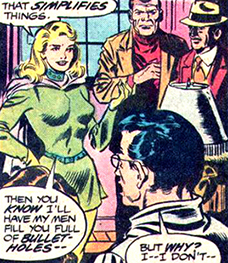 (Captain America Comics#63/4) - Victoria Murdock was the sister of the infamous 1940s racketeer "Killer" Murdock. (All-New Official Handbook of the Marvel Universe#1) - Victoria used her brother's connections to begin a career as a criminal scientist. She provided herself and her accomplices with asbestos-lined clothing to protect them from fire. (Invaders I#22 (fb)) - Calling herself the Asbestos Lady, Victoria and her gang would set fires before robbing banks in a successful attempt to keep the police occupied. (Invaders I#22 (fb)) - Hoping to further her knowledge of asbestos, Victoria planned to kidnap Fred Raymond a former asbestos researcher who was now living a quiet life with his wife Nora and son Thomas. Luckily for the Raymonds, the original Human Torch (Jim Hammond) had a hunch the Asbestos Lady would go after Fred Raymond and came to their rescue. The Torch fought off the Asbestos Lady's gang, allowing Victoria the chance to escape. (Invaders I#22 (fb) - BTS) - Eager to get her revenge on the Raymonds, Asbestos Lady learned they were planning a train trip. She caused a huge tree trunk to fall on the tracks, causing a crash that killed the Raymonds. Unbeknownst to the Asbestos Lady, their son Thomas survived and was eventually was adopted by a family of circus performers where he discovered his flame powers and, taking the nickname Toro, started performing. (Invaders I#22 (fb)) - The Asbestos Lady overheard radio reports about Toro, the famous fire eating boy working at a local circus. Her curiosity peaked, Victoria decided to capture the boy but she also figured news of Toro's existence would attract the attention of the original Human Torch. To make sure she could get to the boy unopposed, she decided to set a trap for the hero first. The Torch proved too clever to fall for the trap and melted the asphalt the Asbestos Lady was standing on to stop her from escaping. (Marvel Knights - Spider-Man#9 (fb)) - After the war ended in 1945, the Asbestos Lady battled the Black Marvel, who eventually defeated her and left her tied to a chair for the police to find. (Marvel Knights - Spider-Man#9 (fb)/All-New Official Handbook of the Marvel Universe#1) - Victoria was eventually approached by a number of businessmen who feared the coming of superheroes. They funded her to continue on as the Human Torch's chief adversary. (Captain America Comics#63/4 - BTS) - Victoria's brother "Killer" Murdock was captured by the Torch and Toro. After a trial, he was found guilty of racketeering and sentenced to death by hanging. Victoria made her way to the execution in civilian identity. (Captain America Comics#63/4) - Victoria witnessed her brother's execution and swore revenge on the Torch and Toro. Calling in her brother's former gang members Jacques, Smiley and Lifter she revealed her costumed identity to them. She also took possession of a disintegrator gun "Killer" Murdock had found in Germany which she planned to use against the heroes. She set a trap for the flaming heroes, even kidnapping famous actress Paula Goddit to use her as bait. After successfully trapping the heroes in a glass cage, Victoria pulled out the disintegrator gun and stepped into the cage. Sadly she had forgotten to make the gun fireproof, so the Torch was easily able to destroy the weapon with a blazing fireball. Ordering her new gang to attack the flaming heroes, the Asbestos Lady once again managed to escape. (Human Torch Comics#27) - A year after her last encounter with the Human Torch, the Asbestos Lady decided the time was ripe for a new attack on the hero. When she learned the Human Torch and Toro were about to take a holiday by train she planned on trapping the heroes in a lake that lay beside the train tracks. In her civilian identity, she joined the heroes on their trip, introducing herself as Vicky Brown the heroes were instantly mesmerized by her beauty. When the train passed the lake she pushed a secret button on her purse which signalled one of her gang members to jump out of the train. The heroes flamed on to rescue him, but got caught by the gang and ended up trapped in the lake. While the heroes were trapped the Asbestos Lady and her gang went on a massive crime spree, robbing a jewelry warehouse among others and killing five policemen in the process. 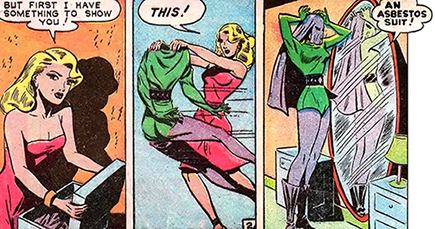 She then supplied one of her men with an asbestos based costume that simulated the powers of the Human Torch. She sent him to steal the gold bullion stored at Fort Wright, figuring the Torch would be blamed for the theft. However, the Torch and Toro had escaped the lake trap. The Torch pretended to be the Asbestos Lady's own underling until he returned to her, then knocked out his imposter. The Asbestos Lady was imprisoned. (All-New Official Handbook of the Marvel Universe#1) - While in prison, the Asbestos Lady eventually learned that she had contracted cancer due to her prolonged exposure to asbestos. Her final fate is unknown, but she is believed to have succumbed to the disease. (Captain America I#253 - BTS) - Travelling to visit Lord Falsworth (the Union Jack), Steve Rogers remembered his time with Falsworth and the other Invaders, thinking back on the menaces they faced like the Blue Bullet and the Asbestos Lady (see comments). Comments: Created by Stan Lee &mp; Al Avision. While Cap remembered fighting the Asbestos Lady as a member of the Invaders in Captain America I#253, this remains an untold tale. The All-New Official Handbook of the Marvel Universe#1 (2006) incorrectly refers to Fred and Nora Raymond as "a pair of leading asbestos scientists". In reality, Fred was the only asbestos scientist in the family and a retired one at that. Nora's field of expertise was radiation. The Asbestos Lady apparently knew all this, seeing she only wanted to kidnap Fred to assist her. The events seen in Invaders I#22 were retold in Saga of the Original Human Torch#2 (1990), the events from Human Torch Comics#27/1 were retold in Saga of the Original Human Torch#3 (1990). Asbestos Lady's henchman Mike's Human Torch costume doesn't cover his hands & head unlike the suits used to impersonate Human Torches worn by the Brain (Kelse Fenton) [Marvel Mystery Comics #18 (4/41)] and the Wizard [Strange Tales I#102 (11/62)], so he is either immune to fire like the bald grey/light purple Inhuman in Fantastic Four I#159 (6/75) or the suit generates a force-field around his hands and head to protect him from the flames. Maybe that disintegrator gun that "Killer" Murdock found in Germany had been built by Dr. Heinrich Zemo, who once built a "death ray" (@ Sgt. Fury I#8). "Killer" Murdock was the Asbestos Lady's twin brother, a well known racketeer who ran his own criminal gang. He also gained possession of a disintegrator gun he had found in Germany during the occupation. 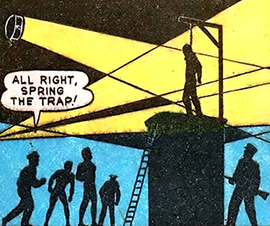 "Killer" Murdock was eventually captured by the Human Torch and Toro and brought to justice, he was hanged for his crimes. 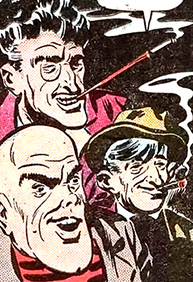 Jacques, Smiley and Lifter were part of "Killer" Murdock's criminal gang. After his death, the criminals decided to work for his sister the Asbestos Lady. 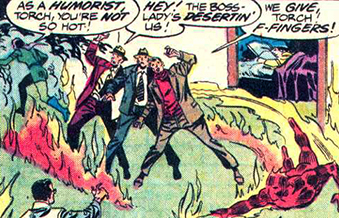 They were involved in the capture of actress Paula Goddit which led to a fight with the Human Torch and Toro. During this battle, they were abandoned by the Asbestos Lady and caught by the police. Larry and two other henchmen were part of the Asbestos Lady's first gang. They helped her rob a bank and tried to kidnap asbestos expert Fred Raymond. When the Asbestos Lady and her gang were attacked by the Human Torch she left Larry and the others to fend for themselves. Quickly overpowered, the trio was sent to jail. Mike was one of the Asbestos Lady's gang members. He received a special asbestos suit made to resemble that of the Human Torch and could even simulate his powers. Dressed as the Human Torch, he was sent to steal gold bullion stored at Fort Wright, figuring the authorities would hold the actual Torch responsible. However, the Torch caught wise, pretended to be Mike and returned to the Asbestos Lady's side where he waited for his copycat to return. Mike was knocked out by the android hero. 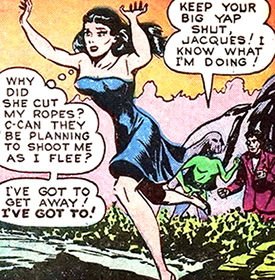 Paula Goddit was a well known actress who was captured by the Asbestos Lady and her gang in an attempt to lure the Human Torch and Toro into a trap. When the villains saw the heroes arrive at the scene, Godditt had served her purpose and was set free.